On August 11, 2017, Melissa Liu interviewed* Fay Bonas—a visual artist, teaching artist with The LP, and Kelly Street resident—about her artistic background and work. Fay most recently made a three-panel work of intricate and detailed buttons, which was on view during July-October 2017. *Note This interview has been edited and condensed for length. Melissa: When did you first start making art and how long has it been a part of your life? Fay: Since I was small. I’m from Trinidad, and we always had art school and art classes. Even in college here, at the Borough of Manhattan Community College, I did art. M: How did you first connect with The LP and the Kelly Street Collaborative and what brought you to The Kelly Street community? 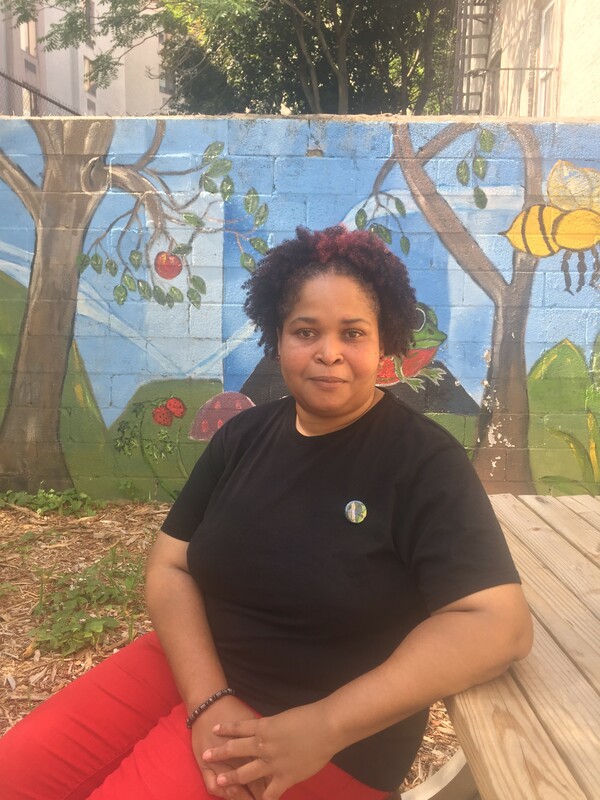 F: I’ve lived on Kelly Street (in Hunts Point/Longwood) over 12 years, and when they renovated the building and attached the garden, I started going to the Kelly Street Garden Committee meetings. One day they were painting a mural in the back [of the garden]. The artist, who painted the face, ran out of time to finish the whole wall. 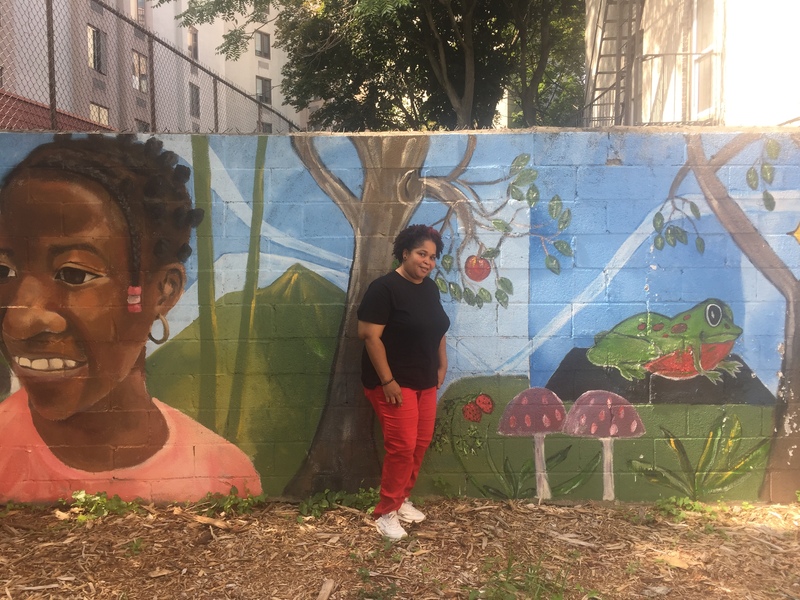 [The Kelly Street Garden Coordinator at the time] Rosalba Lopez Ramirez asked me, “Can you finish it off?” It was about ten years since I painted, so when she asked me, I just did it and painted it. I was like an outsider just looking in. When Rosalba asked me, I envisioned the rest of it. The sunflower, the bee, the mushrooms, he [the previous artist] already had the space blocked out in blue so I was envisioning what would go well with that. From painting the mural, everybody associates me with the wall and doing art. That was a reawakening of the artist in me who was dead for ten years. The staff from The Laundromat Project saw the mural, and that’s how I got connected with them. M: Who the girl is on the mural? F: That’s Janiya! One of the kids from here on Kelly St. who still lives here. I guess the previous artist wanted to do a whole wall of kids, but it didn’t worked out. M: You’ve been a teaching artist with The LP for a while now, do you remember your first time leading an artmaking workshop here? What do you enjoy about teaching and making art with others? F: I believe it was the Fish Parade, making paper beads. That was my first art workshop and then it branched off into other stuff. I did a Mother’s Day card making workshop, a Christmas paper-making workshop…a lot of paper! Because I like dabbling with paper, too. It encourages people to come down and see what’s going on in the Garden… what we’re collaborating on right now. It gives the kids something to do and it gets on people’s creative side so that they’re not so distracted with what’s going on out there, maybe they can come down in a safe space and do art. A lot of my art is repurposing paper, learning how to recycle and upcycle stuff. We try to be zero-waste as much as possible here. Isaiah (my son) likes to corral when he knows I’m having a workshop. He makes sure he gets all the kids involved. He tries as much as possible to get them involved, get them down here to do it. M: Your buttons are being exhibited here in The LP’s Kelly Street Collaborative space. Can you share more about the process that led to this work? F: The streetside workshop in front of Laundry Pro (938 E 163rd St) with [The LP’s Program Associate] Emily Mock, started my creativity because the button template was a blank paper saying “what does Kelly Street mean to you?” I turned the paper over and started painting on it instead of using markers. I tried collage, I tried different versions of it and I liked how the acrylic paint worked on it and went off into the random thoughts that go through your head during the day. I’ll be thinking of a beach or something, I’ll paint it, trees, birds…it depends on my feelings. 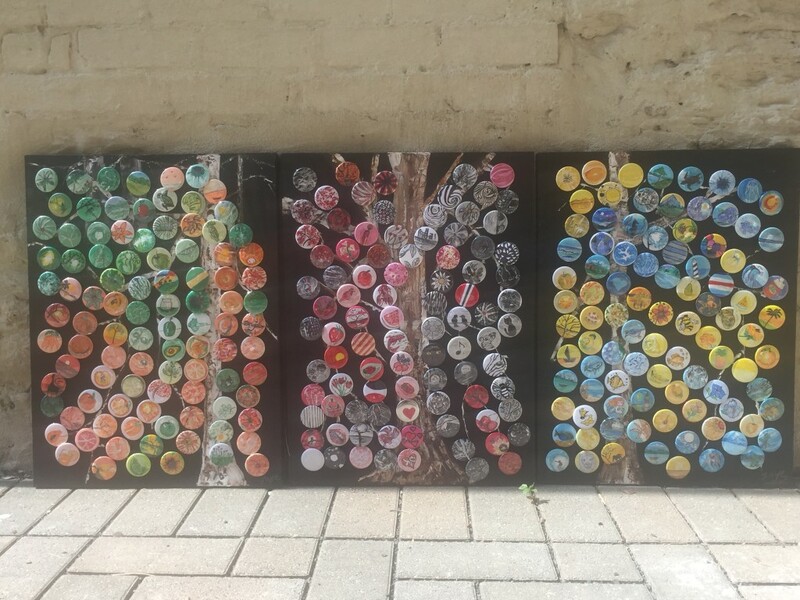 So I went through the series of 300 buttons, doing different colors—orange, green, red, black, blue, and yellow—so they all encompass the 3 canvases. And I attached the buttons to a tree… if you look really deep you’ll see a tree on there, it’s a button tree. It’s like a tree of thoughts, of random thoughts that go through your mind. M: How did it feel to create this art and share it with neighbors? I originally just wanted to do one canvas, one tree, with a couple of buttons on it. But Alicia was like, “let’s think bigger,” and three panels is what came out of it. 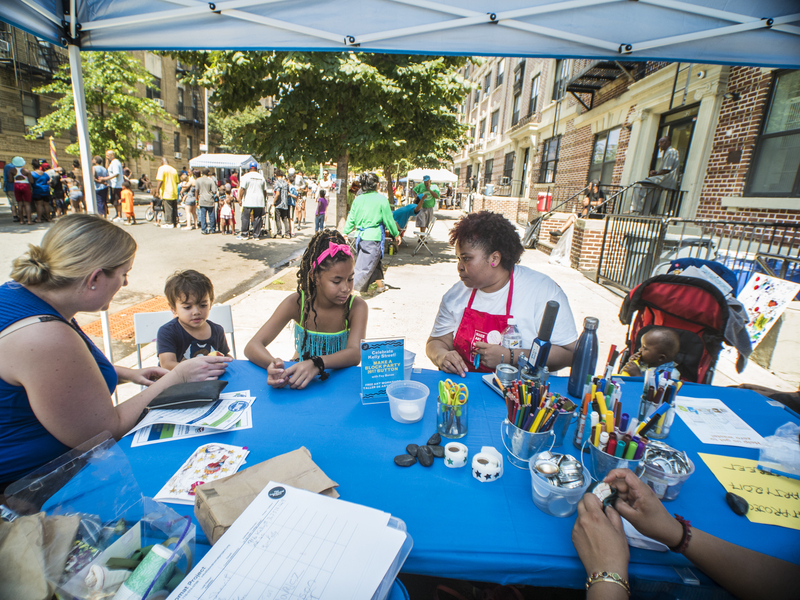 M: How has your experience been, being at the sidewalk workshops and interacting with the folks who come and participate? F: A lot of kids and grown ups sit and talk to you, so they get out what’s on their mind and we tell them what’s going on at the Kelly Street Collaborative—it’s pretty awesome. The kids get to make their own button. 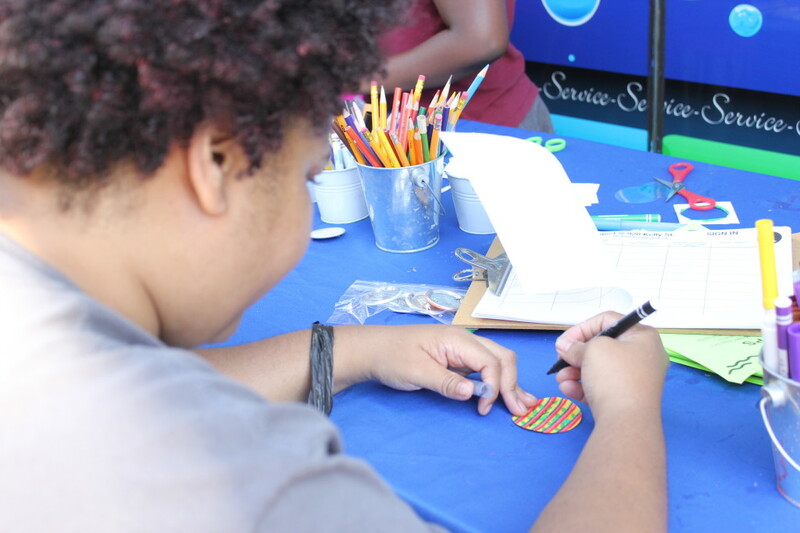 And I’m doing a button workshop for the annual block party with the Kelly Street Block Association. We’re just going to have “Block Party 2017” and they get to design and color on it…. It’s a good souvenir to take away! M: How long has the Block Party been happening and why is it a significant event for the block? F: Well there were block parties back in the 80s and 90s, but it stopped after a while. So when the buildings got renovated about 4 years ago, we started doing the block parties again. So, consecutively, 4 block parties up to now. Even though some of the people moved away, since it started it 4 years ago, it keeps us together. I don’t know if you ever noticed, when you walk out on the block, everybody knows your name and the neighbors ask how you are. They’ll sit and talk to you for a while. So it’s good to just reconnect for the summer and block off the streets so the kids can have fun. It’s the only time of the year they get to ride their bikes up and down the street. M: What do you hope to see happen and continue as far as culture creativity and art here on Kelly Street? 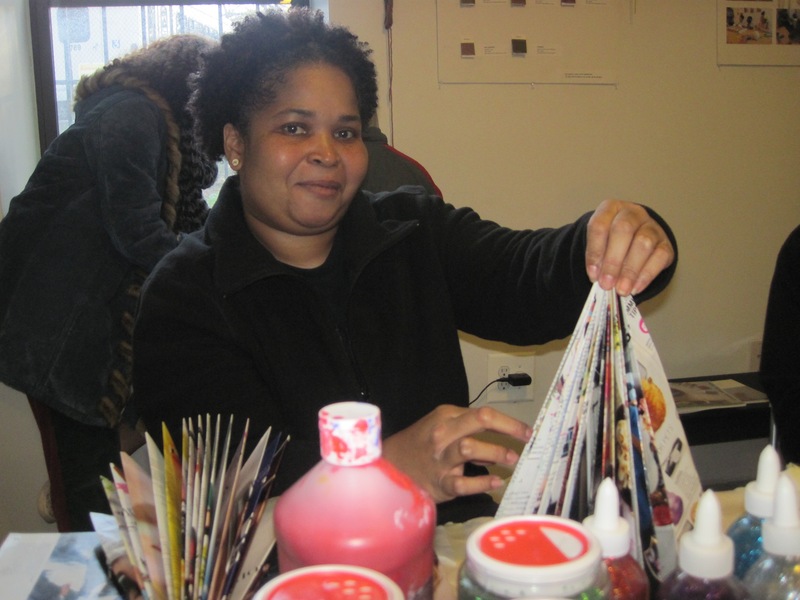 F: Almost every week we have a workshop going on, so I just want to see more people come down and be aware, and come to the safe space to be creative. Because it’s not just painting, it’s dance, or seeing what’s going on at the garden. Even an astrology workshop was here a while ago. Something different, something different in this space. M: What are other artistic happenings that you would share with folks or encourage them to know more about in this neighborhood? F: Boogie on the Bronx, Bronx Museum, I did a workshop there with [local artist, community organizer, and Kelly Street Resident] Sajata Epps. It’s opening up, and becoming more creative. You have to check out the museums. Also The Point. M: What inspires you artistically and creatively in your other work? Are there other artists or creative people who you’ve been influenced by? F: Mostly landscape painting, that’s what I think about. Vacation spots that I would want to go and just landscape, natural things. I’m from Trinidad & Tobago so all of the beautiful view couldn’t just go to waste, it has to be put on paper. Back in the day, you didn’t have cameras, so that was a good way to put your memory on paper or canvas. Of course, the classic Bob Ross. And I had a professor in college that challenged me to go further. I forgot his name now. M: Did you watch “The Joy of Painting”? F: Yes all the time! And back in the day when the tv didn’t work, you’d fix the antenna just to watch him! Now I can just watch him on Youtube. M: Lastly, what advice would you give to your neighbors and aspiring artists out there about being creative and being an “Artist”? F: Just put things down on paper. Express your feelings on canvas, whatever’s going on with you, put it out there. If it’s dance, like Isaiah, just get the stress out because we live in a stressful world. It’s good to just not think about anything for a while and just focus on painting for a while. It takes me away!